DO YOU have trouble getting your content shared? Boy – are you not alone. There have been several studies out in the last year that paint a downright depressing picture about how much content gets shared. The good news is this doesn’t have to be you. And given how low the bar is for getting shares, the tips I’ve outlined below can give you a serious edge. Why? Because so many marketers are so bad at getting their content shared, if you can become even decent at it, you’ll have a huge advantage. That’s not hard to do. But it appears a lot of people just aren’t doing it. 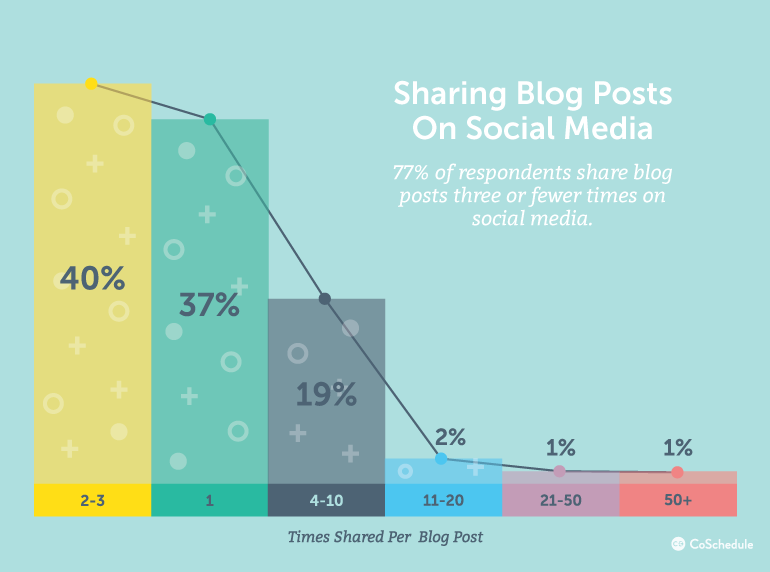 In another study of bloggers done early this year, CoSchedule found that 77% of the bloggers they surveyed share their blog posts three times or less on social media. Ugh. Now you see how bad it is. But again, this doesn’t have to be you. Just add a few simple things to your pre-publishing checklist, and you can crush those averages. 1. Re-share your own content. In the example above, the eight shares I counted mostly included sharing content just once on each platform (except for the tweets, of course). That’s a good start, but you don’t have to stop there. 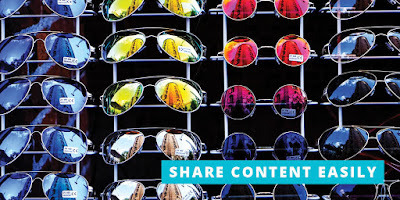 Re-share your content. Even a month after it’s been published. This is especially important to do if the post did well from the start. Tools like Meet Edgar or Buffer can make re-sharing very easy. Re-sharing also makes it easy to save time managing your social media accounts. Don’t worry about boring your audience. Barely 5% of your audience sees any of your posts. So re-sharing them – even multiple times – just means more of your audience will see them for the first time. 2. Send emails with your content to your list. It’s wild how few people do this. According to a recent survey by Scoop.It, only about 30% of marketers send their content via email frequently enough to make it matter. Even though email marketing consistently outperforms social media. 3. Add social sharing buttons – with counters – to every page. 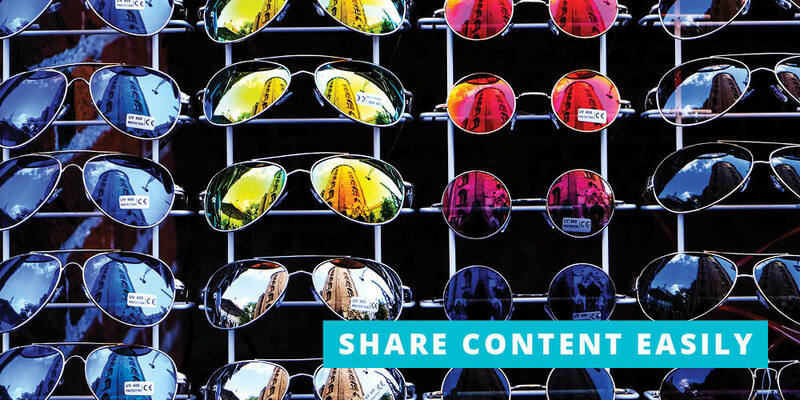 If you want people to share your content, you have to make it easy for them to share. Otherwise they won’t do anything. So if you’re one of the few blogs that doesn’t already have social sharing buttons setup, go tie that down. There are a ton of WordPress plugins and other tools and apps that let you set up social sharing buttons. Social Warfare is a great choice. So are Shareaholic, AddThis, and SumoMe’s social sharing app. Once you’ve got those buttons set up, make sure they show the share counts to your site visitors. Setting them up to show those counts will demonstrate to your visitors that other people liked your content enough to share it. Of course, we still don’t have our Twitter share counts back. (Grrrr…) But there are ways around that. 4. Embed “tweet this” call to actions. 5. Add a nice header image to that will show up when people share something. You know that content with images gets like twice the shares and re-shares, right? So does almost everybody else. So if there’s no nice header image, people know they’re less likely to get their post re-shared. There’s a simple solution: Add a nice header image for everything you publish. Ends up, this has some SEO benefits, too. 6. Set up open graph tags. These are basically like meta tags, but for social media platforms. There are plugins that make setting them up far easier, including the widely-used SEO plugin Yoast. There’s a tutorial for how to do the open graph setup here. 7. Create a really basic “infographic” type graphic for visual sharing sites like Pinterest or Instagram. 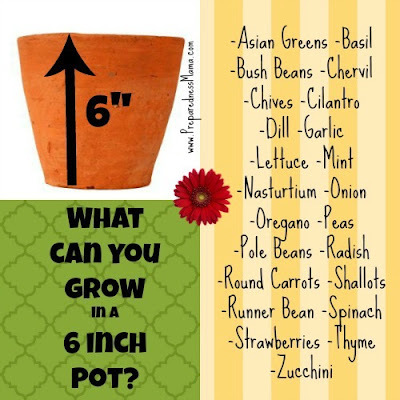 The more you can distill a post or other content into a simple visual, the more it will get shares. Especially if you make it as useful as possible. Not sure how to make even a simple image? Check out Canva. It’s designed for nondesigners. 8. Don’t turn off the comments on your blog. A lot of sites do this because they don’t want to manage comments. If you’ve made that decision, please reconsider. Comments are valuable – you want people to be leaving their feedback. When people leave a comment they also tend to share the content they commented on. And you get some nice SEO benefits. Worried about spam comments? I hear you – some sites get over a hundred of them a day. But stop fretting and just install Akismet. It’s a free WordPress plugin that will tame the tidal wave of spam comments. 9. Create content worth sharing. So please – only publish stuff that’s actually worth sharing and reading. Not sure your content clears that hurdle? Ask yourself: If you came across the content on your site, and you had no affiliation with it, would you share it? If the answer is no, then you need to be publishing better stuff. 10. Consider some paid promotion services. There’s advertising, of course. That’s one way to get your content out there. But also co-sharing platforms like Co-Promote, JustRetweet, and Triberr. Often you can get your content shared on these platforms for just pennies a share. Far too many bloggers and marketers are giving their content promotion short shrift. And it’s costing them – twice. First, all that work to create their content is lost, because so few people see it. Then all those readers – and customers – they could have gotten by sharing their content aren’t ever reached. So that business is lost. The solution? Try to spend at least as much time promoting your content as you did creating it. Even if it means you have to publish a bit less often.